Every year at Christmas time my kids can’t wait to drag out their buckets of Legos and get started building as a family. We’re building shepherds, angels, donkeys, wise men, and more. We’re sharing pieces and wondering what it might have looked like, talking about the story and the details. We’re enjoying our Lego Christmas countdown tradition! 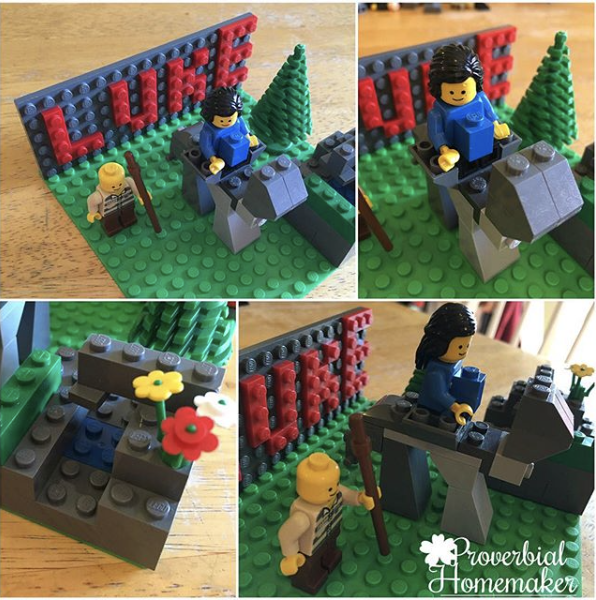 This tradition started a few years ago as I began to incorporate more and more Lego learning into our homeschooling. I realized that my hands-on learners were really benefiting academically by building based on whatever we were learning. Not only would they hear and retain the information better, but they would be developing several other skills as they did it! Why not use this approach to learn the Bible? So we started using several Lego challenges to help my children learn the Word of God and hide it in their hearts. When Christmas rolled around, it just made sense to build through the Christmas story! Decide How Many Days – You could do one for the whole month of December or starting from the first day of advent, but we usually pick 7 or 12 days up through Christmas. Choose the Challenge Builds – Sketch out points from the story of Christmas until you have enough for all the days of your Lego Christmas countdown. Include a Scripture Reading Plan – For each point in the story you’ve chosen to build, write down the verses or passage in scripture to read as a family. Provide Alternate Activities – We have a large family with a range of ages, so there will always be one or two kids who don’t want to build. Provide supplies and prompts for drawing, other materials such as playdoh, and coloring sheets so that they can follow along in a way more suited to them or at least keep busy as the rest of you build. Share Their Creations – Find ways to capture and share their creations! Display them on a mantle, take photos and create a photo book, or share on Instagram (tag @tauna_phomemaker so I can see them too!) or Facebook. My husband likes to set up a camera and record each build project! Then he uses video a editing program to speed it up and watch a time lapse of all the builds when they’re finished. So fun! 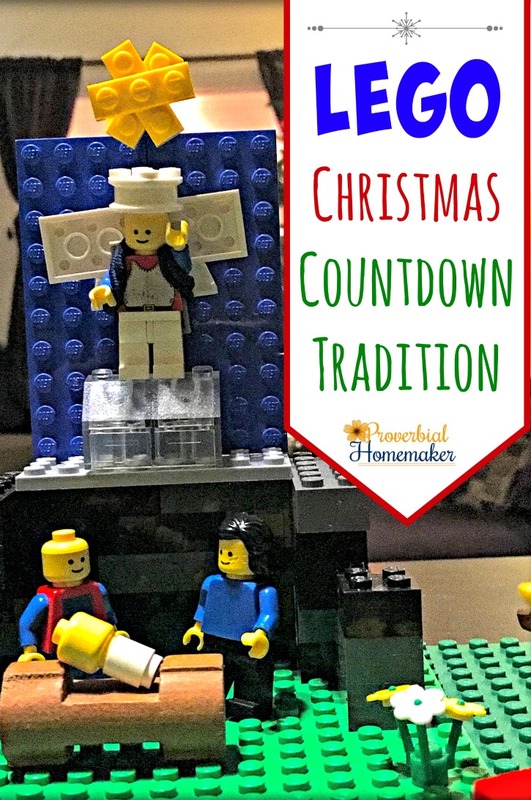 You can set up your own Lego Christmas countdown in this way or use some great tools to make it a quick and memorable activity for your family. Here are some ideas! 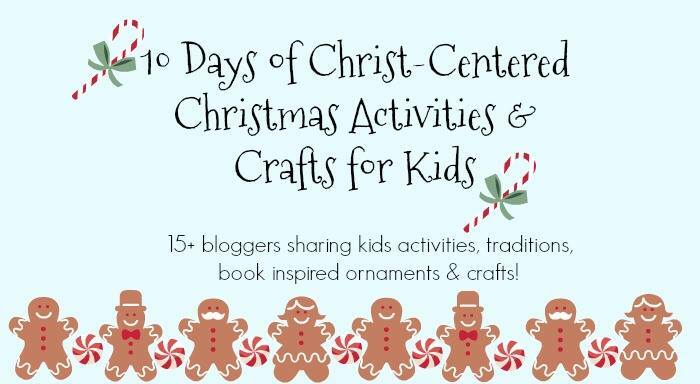 Christmas Brick Challenge – The Christmas Brick Challenge has 12 days of the Christmas story with build challenges, scripture readings, poem to read along with them, coloring pages, and more! Jesse Tree Brick Challenge – For a full month of activities (or you can double up or pick and choose for a shorter plan) try the Jesse Tree Brick Challenge, which starts from Genesis to tell a wider view of the Christmas story and how all of the Bible is about Christ. Lego Advent Calendar – Our kids did a Lego advent calendar this last year and had so much fun! It is secular, but we did it in addition to our other advent actuates and enjoyed it. Lego Christmas Project Instructions – We prefer doing Lego challenges without detailed build instructions because we believe it fosters creativity and helps it to be a multi-age activity (and prevents that big problem when you don’t have a particular piece). But we often browse Pinterest or fun Lego sites for inspiration as we build! Try Brain Power Boy or Little Bins for Little Hands for some ideas. How could you incorporate Lego challenges into your Christmas activities and learning this year? You can visit Here for the full schedule of activities. Enjoy! This is awesome. So awesome! I hope to try this with my boys before Christmas!